Didn’t get tickets to FANDROSS? Join us at the free Midnight After-Show Special featuring Luther fan sing-offs & Special Guest Tawatha Agee performing her Mtume megahit Juicy Fruit! All for the love of Luther! Check FANDROSS.com for specifics and details. 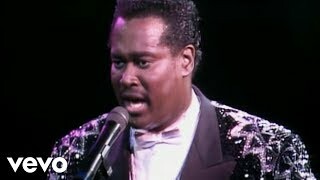 “My Body” was recorded back in 1979 by Luther Vandross when he was working on the colossal album Never Too Much. Today, “My Body” Little Louie Vega Remix is available to stream and features Luther’s original background singer team! It’s A Day For Change! The Italian-based disco group released their first album, The Glow of Love, on this day in 1980. Luther can be heard providing lead vocals on the album’s two big hits: “Searching” and the title track. How Many Of Luther’s Studio Albums Received 2x Multi-Platinum Certifications From The RIAA? Six of Luther’s studio albums received 2x Multi-Platinum certifications from the RIAA. Dance With My Father became the sixth and final on this day in 2004.